The Game of Thrones universe is vast and with so many characters playing the game, also tends to be confusing. 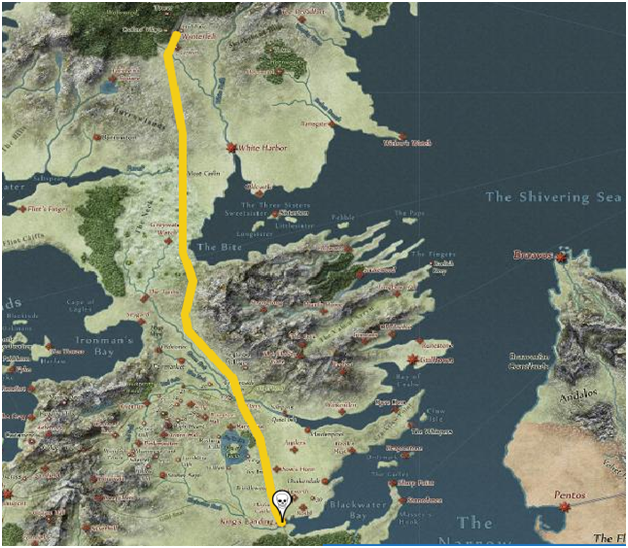 Check this confused Fan's guide for GOT places. Everybody who was stumped by how Varys surfaced in Dorne after he left Meereen and then almost immediately after, had boarded the ship with Daenerys, you are not alone. The Game of Thrones universe is vast and with so many characters playing the game, also tends to be confusing. One can easily feel disoriented about the timeline, the trajectory of characters and where in this mythical realm they are at any given moment. Of course, there are fans who know the complete name of Daenerys (Stormborn of House Targaryen, Mother of Dragons, Breaker of something...) and remember the exact order in which people were butchered at the Red Wedding. For lesser mortals like us, there is Quartermaester. 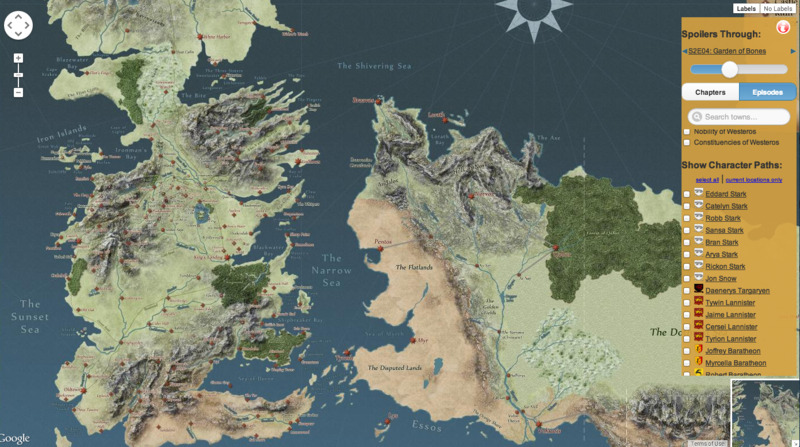 Developed by a web production editor from United Kingdom who goes by the moniker Ser MountainGoat, Quartermaester is an online interactive map of the fictitious realm in which Game of Thrones characters reside. See that slider on the upper right-hand corner? Adjust it according to how far you have progressed with the series, if you do not want spoilers. It contains locations of both confirmed as well as speculated places in the series and gives you a lesson in the strongholds and sigils of different Houses in the Seven Kingdoms. Clicking on each sigil directs you to A Wiki Of Ice And Fire entry for that House (or location). 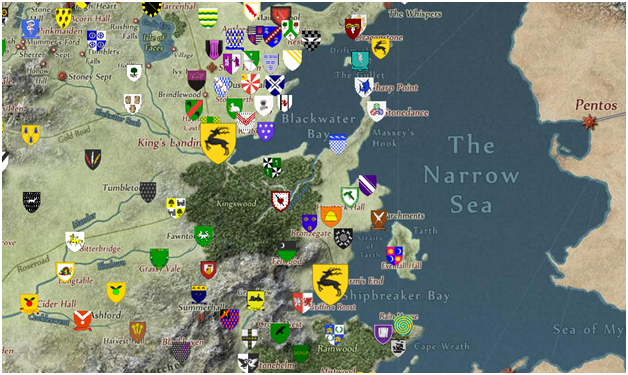 Notice the three Baratheon stags at King’s Landing, Storm’s End and Dragonstone in the first season? You can also observe the trajectories of all principal characters by episode, if you follow the show, or by chapter, if you are a book nerd. ...Daenerys Targaryen has basically covered half the world in six seasons to rally support for her claim to the Iron Throne. 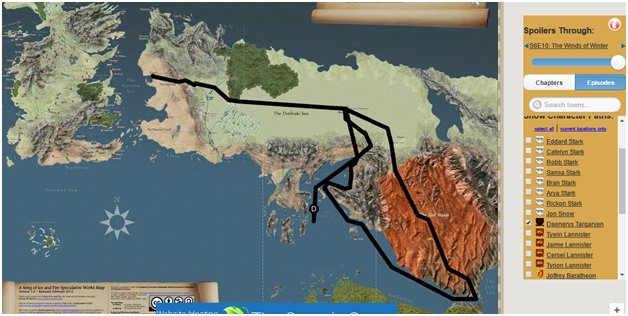 The map keeps getting constant updates as the series progresses, and with the books and show on a temporary hiatus, currently shows the locations of the characters as they were left. Check out the Quartermaester map here, and flaunt your newfound Thronie knowledge before your friends!